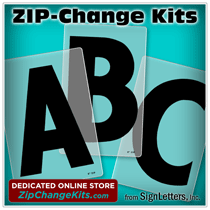 These Zip-Change sign letter kits feature the Modern ZipChange style (or Pronto Modern style ) and can be combined with other high quality changeable readerboard letters ( like our Gemini Pronto sign letter kits ) for use with a variety of reader-board systems. We provide these Zip Change sign letter kits as a service to our customers who need replacement letters for their existing signage system. We highly recommend Gemini products for these changeable sign letter replacements.